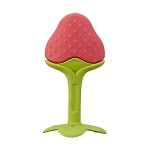 An adorable fruit teether that's easy for baby to hold on to! Warning: Do not leave child unattended with this product. Inspect teether before and after each use. Discard or replacement if torn or damaged. Made a wonderful shower gift for a new mom. This is by far my baby's favorite teether. It's the perfect size for her to hold. She loves to feel the different textures and of course chew on it. My daughter loves this teether. At 5 months, we've tried a handful of different teethers. This one never fails to make her happy. 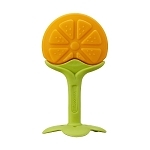 We have the citrus style, and she loves chewing on the little flaps on the bottom. It's easy for her to grip and chew on. The holes on the bottom would be great for attaching a paci clip, as babies tend to drop these. 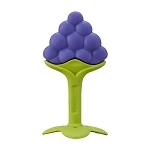 We absolutely LOVE this teether!! Made my sons first tooth so much easier to come through! I would recommend to anyone! We will totally be buying some more! My daughter absolutely loves this...Would highly recommend!